Local Trust - Big Local Connects: You are invited! We’re kicking off our new approach to learning and networking with an event that’s open to all Big Local areas. By Rachel Rowney, director of programmes and resources. "I’m really excited to be announcing the first event aimed at bringing together all 150 areas in one place: Big Local Connects, which will take place on 29 and 30 June in London. We are designing a programme packed with ideas, inspiration and fun. Alongside 2 days filled with stories and updates, activities and learning, there will be ample time for you to make contact with other Big Local areas and share your experiences informally. We’re eager to create an event that is all you want it to be, so please let us know what you would like to see included or covered. That could be topics that you want to explore, sessions you could run, activities or anything else. Please let us know your ideas by taking part in this short survey. Finally, please put Big Local Connects in your diary and tell others about it. We’ll be sharing the details about how to sign-up to the event soon and I hope you’ll join us for what is going to be a very exciting 2 days, and a first for Big Local. Running a large scale event that brings all Big Local areas together means that we are giving spring events a break this year. I will miss the relative intimacy of these events, and we recognise the value of connecting Big Local areas located near each other, or with similar interests. That’s why we’re going to continue to support areas at a regional or sub-regional basis who want to learn together – both regularly and as one-offs. 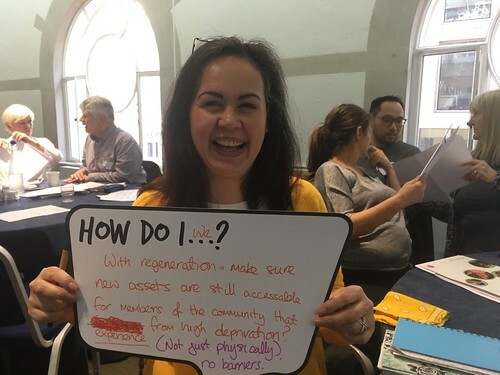 We recently launched Big Local Learning Clusters to enable areas to connect over the issues they have in common or shared priorities. We’ve been encouraged by the positive response so far, and thank you to everyone who has made suggestions for future topics – we’re looking at incorporating those into the next group of Learning Clusters. We also know that some areas already meet up, and we’re going to look at supporting these smaller scale events too. So, if you are interested in joining a group or even running a spring event-style day for your area and those nearby, let us know so we can support that." Find out more about our new approach to Learning and Networking with Big Local.